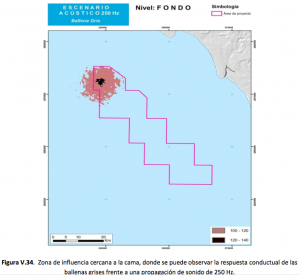 aeinews.org » Blog Archive » Seabed mining: is 35 miles too close to whale nursery? Seabed mining: is 35 miles too close to whale nursery? What’s not to hate about this? And indeed, I was quickly riled up by a proposal to mine phosphate near a Gray whale birthing lagoon in Baja California, Mexico. 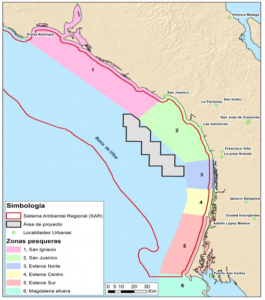 An article on The Ecologist’s website stressed the mine’s threat to San Ignacio Lagoon, the southernmost of two lagoons where over 2500 whales arrive each winter to give birth and nurse their young. 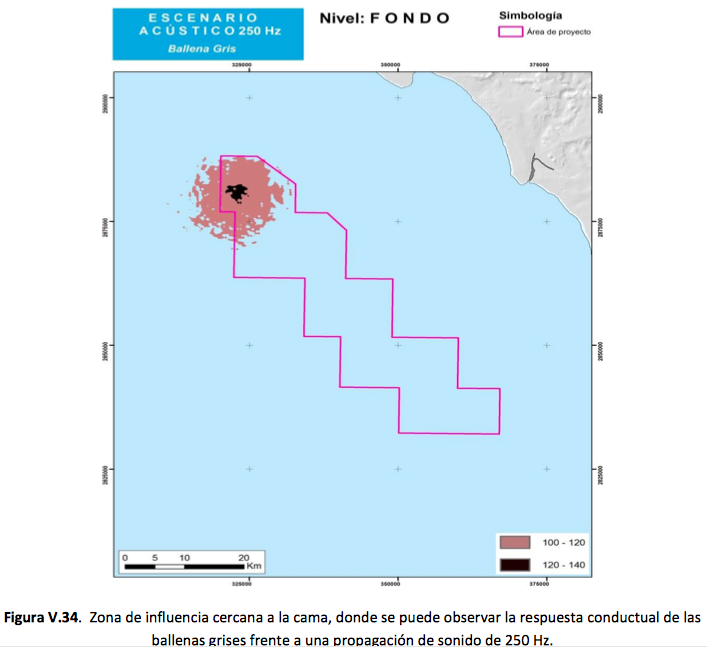 The mining will take place in five areas within a 350 square zone, 12-21 miles from shore, and roughly 35-70 miles from the mouth of San Ignacio (inlet in pink on map below; mining area in grey). Spurred by this article, I dug into the project’s environmental assessment to get a sense of how extensive the noise impact of this new mining operation would be. And while there may well be serious issues with returning sediment to the ocean after separation on boats above, direct effects on local animal populations living in the mining zone, and other environmental impacts from the unproven mining techniques to be employed, I have to say that I was surprised at how modest the noise will be. 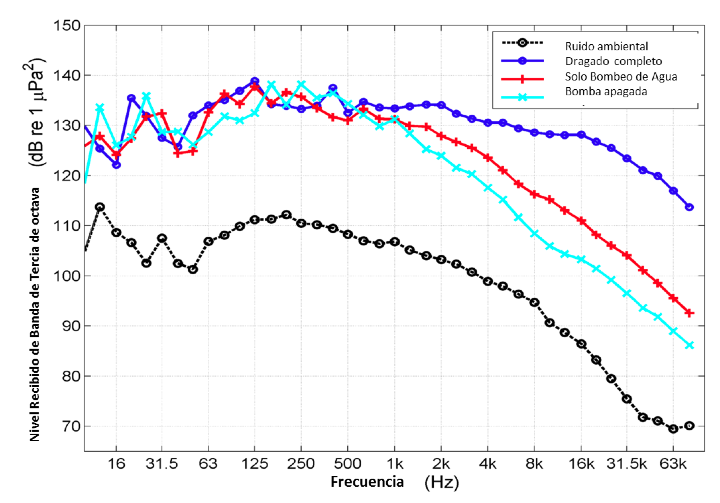 Unlike the subsea processing facilities noted above (150dB broadband noise, peaks of 180dB at 2-5kHz), the dredging operation produces noise only 20-30dB above the background ambient sound of the area, peaking at 130-140dB (image at right; ambient black, operations in color). The environmental assessment took a relatively conservative approach to assessing behavioral impacts, charting the zone where sound would be over 120dB (black on map below; about the lowest level at which behavioral effects have been noted), and also where it would be 100-120dB (i.e., audible at all above natural ambient; brown on map). The behavioral effects zones for the Gray whales are surprisingly small, extending 5-6 miles from the mining ship; most other species have smaller impact zones, while the humpback whale zone is slightly larger. Nonetheless, the EA notes that some whales could venture into these zones, and may show some response, including modification of vocalization patterns or avoidance/alerting reactions. The planned operations will spend 10 years in each of five sub-zones in the red outlined area; thus operations will extend over 50 years (assuming the economics of the project continue to make sense), with some decades of activity closer to San Ignacio than others. The near end is about 35 miles from the lagoon, and the far end about 70 miles. So, we are left in a familiar place for noise issues, one that’s more grey than black and white. How much noise is too much? How close is too close? Clearly, the noise from these operations is unlikely to extend into the immediate vicinity of the birthing lagoon, but some whales will hear the sounds when they are foraging outside the lagoon. And of course, the dredging and pumping sounds from this mine is far from the only human noise source in the area; offshore shipping and local fishing and whale-watching boats are regular elements of the soundscape. Will this mine add significantly to the acoustic burden the whales are already living with? Yes, it would be best if we could simply refrain from adding any more noise to the oceans, or to terrestrial habitats for that matter. 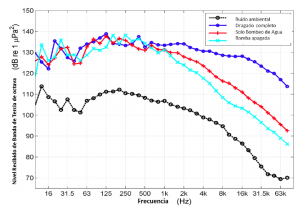 But is every noise source worth fighting? Extremely loud sounds (e.g., explosions, military sonars) can cause injuries and widespread behavioral responses, while new intrusions of even moderate noise into remote areas still mostly enjoying “natural quiet” are important and immediate threats to healthy acoustic habitats. It just may be that subsea mining is not as big an acoustic threat as I’d feared it would be. Remember, though, that the non-noise impacts of this plan may be far more worrisome, and are definitely more unknown (this would be one of the first working subsea phosphate mines in the world). 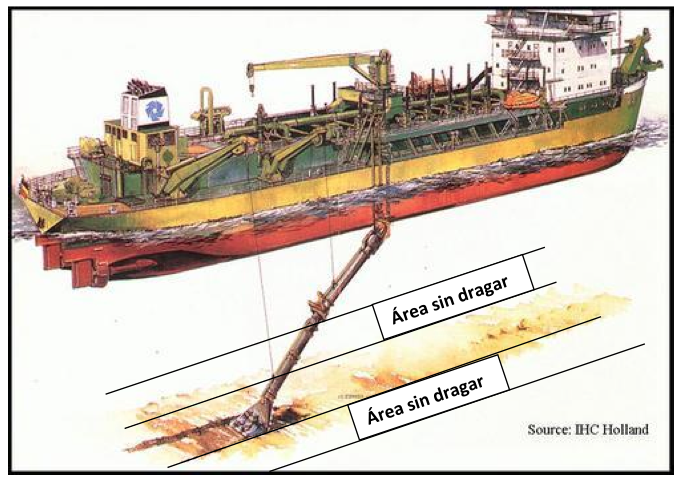 The Interamerican Association for Environmental Defense (AIDA) is actively fighting the project; its comments on the EA (in Spanish; GoogleTranslate helps!) stress the biological richness of the area, the full range of environmental impacts (ie not mostly about sound), and decisions made elsewhere to turn down similar proposals.